A little headache of a book, this, and one of the few really wrongheaded sequences of late-'90s Dredd. 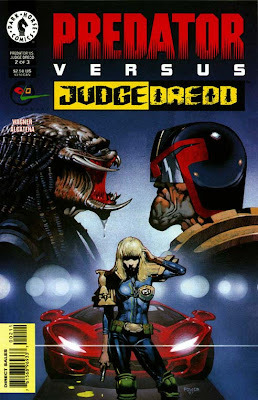 I'm not sure what the Predator franchise has to do with the Judge Dredd franchise, or where the idea of having them meet came from: this wasn't a natural match like the Batman crossovers. I also don't know enough about Predator stuff to have any sense of how well this works as a Predator story. It's a weak, dull Dredd story, though--one long, sadistic fight-and-slaughter sequence with very little sense of suspense or dramatic development. 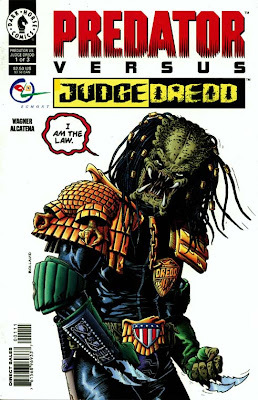 It ran in the Megazine a couple of months after its U.S. appearance (in issues #3.36-3.38), and the first issue of the American version even featured one of Brian Bolland's very-rarely-produced-by-that-point Dredd covers, pictured below. It'd have been a lot more entertaining if Bolland had drawn the whole thing, but it's a really ugly-looking story, to the point where it's tough to get through. Enrique Alcatena has generally drawn fantasy stuff, rather than hard-edged SF (this is the only time he's ever drawn Dredd). He may or may not have had adequate reference material for the look of Mega-City One--although I doubt it, given the scene on which Schaefer gets into her car, which looks for all the world like a 1972 American model (there's that "outdated automobiles" problem again)--but he clearly wasn't terribly interested in it. And the presence of four colorists suggests that at least some aspect of this book was a serious rush job. Still, I do prefer Alcatena's underslept auxiliary-in-civilian-clothes Schaefer to the boom-boom Anderson lookalike version of Schaefer that Dermot Power drew on his cover for the American miniseries (in front of another, slightly less anachronistic car). 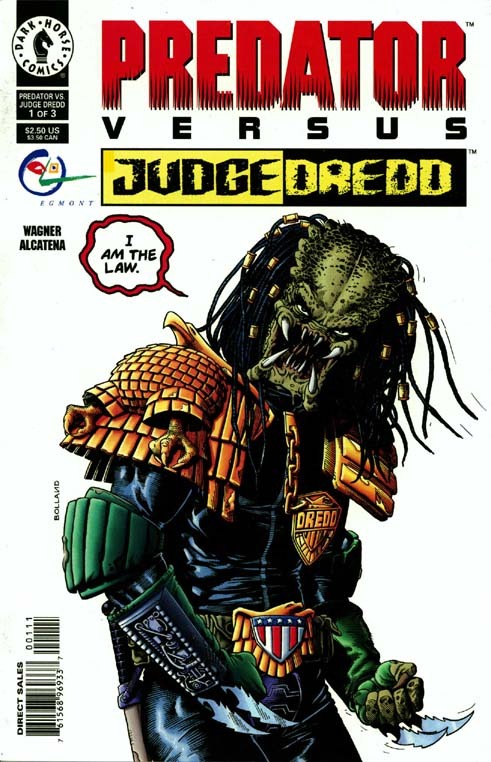 Parts of Predator Vs. Dredd read little enough like the rest of John Wagner's post-1980 writing that I almost wonder if it was heavily rewritten by somebody. Flipping through it, I see some kind of not-quite-right thing every few pages: "We got a right to a jury trial! "; Dredd narrating his initial fight with the Predator; the reference to "2049th St." (are there numbered streets in any other Dredd story? ); Dredd apologetically noting that he's a little short-tempered, then thinking "it's myself I'm angry at" (thought bubbles don't tend to be his way); "C'mon, Tulk! In at the death! "; the "Mark 7 war droids" that resemble neither the Mechanismos nor anything else we've seen, as far as I know... And is it a little weird that one of the decapitated Judges is named Millar? Anyway. Next week: this blog's first long entry in a while--Marc Singer joins me to discuss The Complete Case Files vol. 19, in which we get our first look at Grant Morrison and Carlos Ezquerra's "Inferno." You've managed to say so much by saying so little, Wolk. Sorry I won't be clicking on the link to buy the book on Amazon, but since we're talking pointless licensing books- are you planning to look at the 1995 movie adaptation by Andy Helfer and Carlos Ezquerra? It doesn't quite fit your criteria- since it's out of print- but I don't think it's ever going to be reprinted elsewhere. It is Carlos, though- and to be honest, I'm looking for an excuse to waste money on something I know is going to be complete rubbish. If you were to review it, the thrill of reading along would provide me with the flimsy pretext I need. Sauchie if you want it I can send it to you via cbr file. D v P is awful lookin shite, reminds me of the DC Dredd. "I'm just trying to cover all the non-redundant squarebound collections, because I have to stop somewhere." On the day you finish your final blog, I'm going to force your car off the road, hobble you, and make you review Dredd stories forever. and youtube it of course.